Stretching the One Income Dollar: Motel 6 -Saskatoon, Sask. Before we head out for vacation, we usually spend the night in Saskatoon, as that is where are regular airport is located. This way we offset some of the tiredness that we acquire traveling to Saskatoon before we continue with the next leg of our journey. 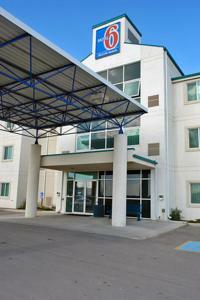 Next month when we travel to Philadelphia and Atlantic city we will be staying at Motel 6 Saskatoon. The motel is located close to the airport which is very important to us while travelling. There are some great things included while staying at the Motel 6, including an extended cable package, morning coffee, free wi fi high speed internet throughout the building and an indoor pool and a indoor hot tub. Motel 6 is also pet friendly, although Jake is not coming on this adventure. There is a restaurant on the premises, as well as several nearby, which is great for weary travelers desperately in search of a coffee. Since flights can depart and arrive at various times, it is great to have a place to lay your head before or after you travel. With so many things to worry about when you travel, an exhausting trip home should not be one of them.